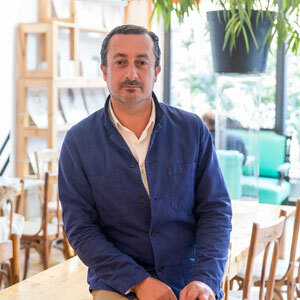 Kamal Mouzawak is the founder of Souk el Tayeb, Lebanon’s first farmers market. Kamal is a son of farmers and producers, who grew up in gardens and kitchens, tasting life, food and land fruits at their source. After a major in graphic design, Kamal followed paths of food and travel writing, teaching macrobiotic cooking, worked as a healthy cooking TV chef. That all lead to more involvement towards social and environmental change and transformation. Since its first days in 2004, Souk el Tayeb had the vision of celebrating food and traditions that unite communities and promoting small-scale farmers and producers and the culture of sustainable agriculture. Today’s Souk el Tayeb is an institution that includes a weekly farmers market, “food & feast” regional festivals, “souk@school” education and awareness programs, el tayeb newsletter, “dekenet Souk el tayeb” … and the latest project of “tawlet Souk el Tayeb”, the farmers’ kitchen.